Oak Meadow Elementary teacher Cindi Prahl couldn’t say enough about Rotary Club of El Dorado Hills Student of the Month Bella Buhl. 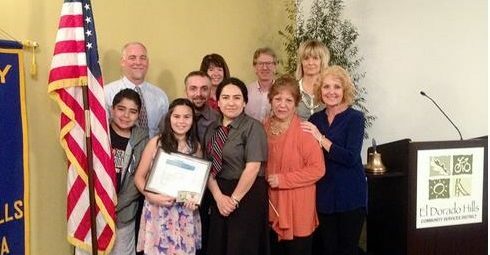 Rotary Student of the Month Bella Buhl, holding plaque, is surrounded by her support system. 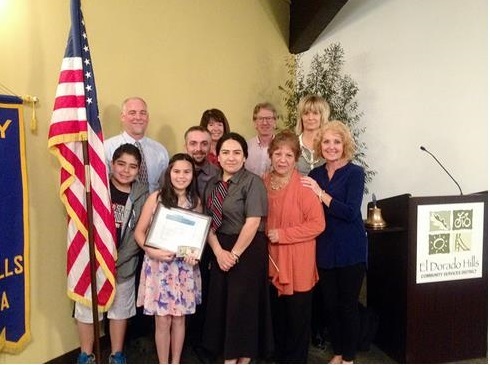 Front row, left to right: brother Dante Buhl, mom Gissela Buhl, grandmother Maria Diaz and grandmother Linda Giannini; back row, left to right: dad John Buhl, uncle AJ Buhl, Principal Barbara Narez, Buckeye Superintendent David Roth and teacher Cindi Prahl. She called the fifth-grader a great problem solver, collaborator, leader and listener. Bella, 10, and her family are residents at Mercy Housing. She has participated in Oak Meadow’s cross country team and is also an anti-bullying advocate. She shows great respect for people and also has a love for animals that will likely translate into a career later in life, Prahl hinted. Principal Barbara Narez said Bella’s name came up over and over again when deciding which student should receive the Student of the Month honor. Bella received a plaque and $50.